Following Saturday's winter storm Gia that blanketed the metro area with 11 inches of snow, crews have been working to restore power to more than 180,000 customers. KANSAS CITY, Mo. — Following Saturday's winter storm Gia that blanketed the metro area with 11 inches of snow, crews have been working to restore power to more than 180,000 customers . 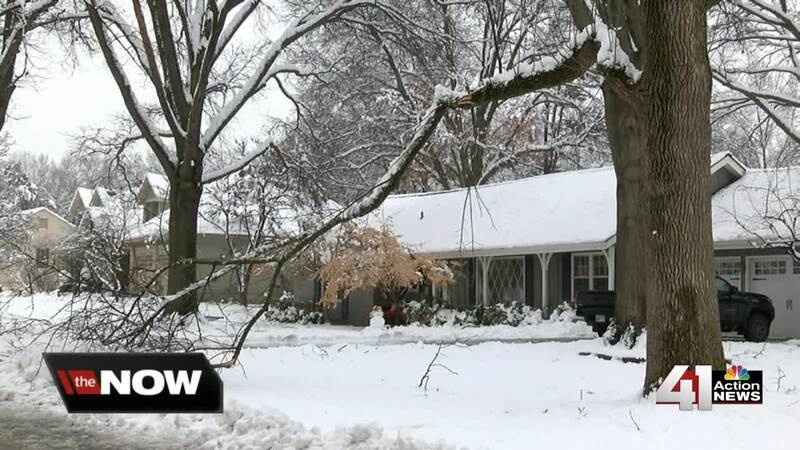 Several neighborhoods in Leawood remained without power Tuesday. Homeowners told 41 Action News, a number of branches fell on top of power lines in their backyards causing the outages. Tuesday, KCP&L said Johnson County and south Kansas City were hit the hardest. More than 2,000 crew members were out Tuesday working to restore power, including a number of utility crews from out of town. As of Tuesday afternoon, 16,000 customers remained without power. Crews are hoping to have all power restored by Thursday. "On average, each individual outage ticket that folks work, that takes on average two hours to work, it only brings seven customers back on. That's the kind of place we are in restoration today so it's a lot slower, we're in a lot of backyards so it's a lot harder to get back there, we're taking more equipment, but crews are doing a great job," said Katie McDonald, KCP&L Spokesperson. KCP&L said Saturday's storm was the third worst in company history. As crews continue to restore power, they are also anticipating another storm this weekend. "It's a real concern because with another storm, we may be the ones that are hit, it depends upon where it hits in the city. North of the river, the weather is very different than south of the river, but it just happened to come through this area," said Bonnie Bartalos, Leawood Resident. KCP&L is hoping out of town crews will remain in Kansas City to help. Cities around the metro have begun informing residents about how they can get rid of any debris from the storm. That info can be found here .